Two weeks down and getting ready to start week 3. So I print out the new workout cards for workouts 4, 5 and 6. Now, I understand the point of 1RM, but I was really surprised at how much my weights increased on some of the exercises. And dubious. But I want to do this right and that is one of the reasons I am doing the 5.5 month rotation–so I can tweak each workout the second time around. There is also an… “unevenness” to the increase in pounds. Cathe does address this. Let me explain. For tricep kickbacks I started with 15 pound dumbbells. This mostly worked well for me on Disk #2. The only time it didn’t was the first set of tricep kickbacks; I could do them all, until the end when we hold isometrically at the top of the move then lower slowly. 15 pounds was too much for that final burn move. But that’s ok–I went to failure and completed almost every rep. Disk #5 wants me to do 17 pounds for tricep kickbacks. Dumbbells aren’t made in 17 pounds. They just aren’t. I do own Select Techs which have a 17.5 pound setting (which is useful for some shoulder and bicep odd poundages btw) but we’re talking triceps here–a small muscle group. I am skeptical about 17 pounds let alone 17.5! Cathe makes weighted gloves with a zip pouch. You can add and remove the weight. So if all I had is 15 pound and 20 pound dumbbells (which is what most people would have), I could wear the gloves and add or subtract the appropriate weight from it to get the weight I need. There are problems with this. I own Cathe‘s 2 pound weighted gloves and Beachbody’s 1 pound weighted gloves–I use these for kickboxing. Cathe’s do not cover the palm and Beachbody’s has the weight in the palm–so Beachbody’s is out since I cannot grip a dumbbell with the weight in the palm. In essence Cathe’s should work, right? But they don’t and here is why. I am lifting weights, therefore I am wearing weightlifting gloves. Do you know how long it would take to force the weight gloves over my weight lifting gloves? They are both tight fits to begin with. And then if I had to start adding and subtracting weight from the glove? That means I would have to pause the DVD player–which not only extends my precious workout time but defeats the purpose of meso 1! We are only supposed to get 30 seconds of rest between exercises–it is a fast-paced program. If I have to keep pausing the DVD to make these adjustments I am resting more than 30 seconds and I am not getting the “true” workout. How did I handle this? My first attempt was to push through. Let’s talk about Disk #4. I increased weight based on what dumbbells/plates I had available. This did not work out as well as I hoped. In some cases it was great. For instance, standing upright rows with a barbell. It said I needed 34 pounds. So I just used 35 pounds. It was challenging, but doable. I did all reps. Same with alternating standing bicep curls. It said I needed 19 pound dumbbells, I used 20 pound dumbbells and did it–again challenging but doable. Lets go to standing barbell front press. It said I needed to lift 42 pounds. WTH? I’ll be honest–I didn’t even try. I loaded 35 pounds onto my barbell and I did not get the 21 reps. Going to failure is fine if you you’re failing one or two reps short of how many reps you are supposed to do. But I did not fail at 19. I failed at 15. So, the next week I dropped to 30 pounds and was able to do all of the reps–and it was challenging, not easy. In a sense, it makes me feel like a failure. I’m supposed to be able to do this, right? Why else did it calculate that amount for me? Let’s talk about disk #5 now. This one is more significant because it is Back and Triceps. Since I was failing on tricep kickbacks during the bonus burn during disk 2, I kept it at 15 pounds for kickbacks. However, some of the tricep exercises had me at 11 pounds or 13 pounds. For the 11 pound exercises I just went straight to 12 pound dumbbells and that worked. I was either able to do all of the reps or I failed on rep 14 (total reps 15). For the 13 pounds, I used my beachbody weighted gloves. Since they secure with velcro, I just wrapped them around the top of the handle. It didn’t cover the entire handle so I could hold it fine. That actually worked really well. So, if it makes me do 14 pounds, I’ll just use Cathe’s 2 pound gloves and do the same thing. For back, it initially had me doing barbell rows and deadlifts with 71 pounds. I used 70 pounds for Disk #2. For Disk #5 it wanted me to do 78 pounds! Again–a pretty big jump! I did 75 pounds. It was tough but doable. On a side note, at the end of Workout #5 you do drops sets using 3 different sets of weights. Cathe actually uses her weighted gloves! You have 10 seconds between each drop set–so she used the 10 seconds to frantically rip the little sand bags out of the back of her gloves and throw them on the floor. It was a little too frantic for my liking. I think I will stick with the way I am currently doing it. Disk #4 Chest, Shoulders and Biceps: 55 minutes; warm up 4 minutes, 50 minute training time and stretch approx 45 seconds. With this week, you increase the amount of weight you are lifting by 5% (to 65% of your 1RM). Holy cow! This workout was brutal on so many levels! First, as you can see below, it begins with 50 push ups! I actually prefer this. I can do lots of push ups on my toes–if it is fairly early in a workout that is. But the more fatigued my muscles get, the harder push ups become. This is obvious, but Cathe litters pushups all through these workouts and I won’t lie–by the end of the workout, I dropped to my knees. The final set of push ups–21s, I did on my knees (this review was started the first week I did this workout; the second week I did every push up, including the final 21s, on my toes, so I am clearly getting stronger). But all the others I did on my toes. Also–that 5% increase in weight had me reaching muscle failure a few times, which is a good thing, except when it happens as I described above in the overview of weeks 3 & 4. But that is why I am doing the 5.5 month rotation–so I can tweak it the second time I do the workout. For this workout you need a bench or your step with 5 risers on each side, a chair (or just use your step), dumbbells, barbell, stability ball, mat and dynaband. 58 minutes; 3:30 minute warm up, 53:30 minute training time and 1 minute stretch. It is already becoming redundant for me to state that this is a super tough workout—but it is! And like Legs, I attribute it as much to the exercises as to the increase in weight. I will say I like Workout #5 better than Workout #2. Not sure why, I just do. The first 4 exercises are “warm up sets”—in addition to the 3:30 minute warm up. So for the dumbbell rows you are not lifting 65% of your 1RM—you are going lighter. For this workout you will need a bench with 5 risers each side, a chair, a pull up bar or bands, a stability ball, dumbbells, barbell and a dynaband. Disk #6 Legs: 56 minutes; 5 minute warm up, 50:30 training time and 30 second stretch. For this workout you will need the high step at various heights, a chair, dumbbells, slide and glide disk or paper plate, dynaband, stability ball and ankle weights. OMG. This workout was brutal. BRUTAL. I attribute it as much to how advanced these workouts are (and this includes the fast pace of the workout) as to the increase in weights. My workout card jacked me up to 45 pound dumbbells for squats. That is 90 pounds. I know from experience I can squat 90+ pounds with a barbell—but dumbbells are a different story. The first time I did the workout I used 45 pound dumbbells and got through all the reps, but I felt like my arms were going to rip out of my shoulders. Then you go straight into calf raises while still holding the dumbbells. OMG. When it was over I just opened my hands and released the dumbbells. I never do that. My heavy dumbbells are expensive Select Techs; when I finish a move I carefully place them back in their stand, I never just dump them. Well, I did this morning. I am seriously scared of workouts #9 and #12. So scared that the next time I do this workout I am dropping to 40 pound dumbbells. I would so much rather be using the squat rack and barbell. Other than for squats and deadlifts, the weight you use is much more moderate—but this workout is still killer. It never stops and it is tough. My glutes, quads, hamstrings and calves are still stinging hours later. If I do not suffer serious DOMS I have only my post-workout whey protein shake to thank for it. It has served me well so far throughout STS. Thank you!! That is very helpful and I will do that!!!! I understand not wanting to do the 1RM testing. I plan to do STS again next year and I don’t want to do 1RM testing again either. But when I did it, it made a big difference. I lifted heavier than I ever thought I could due to 1RM testing. But by doing the longer rotation you can basically do your 1RM testing the first week since you repeat each week. Make sure you have your workout sheets and a pen. I just write an up arrow next to whatever weight I used if I think I can lift heavier the next time. 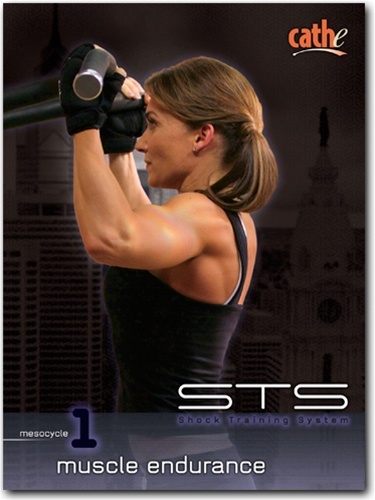 I have no idea what Cathe is lifting during STS. She doesn’t share. And I have workout cards for every time I’ve done STS (3x now) with my weights on them. I didn’t add them to the review. It’s been about 2 years since I’ve done STS, so I cannot remember what I lifted. When I return to it next year I will probably do the long rotation and just gauge what weights I should use by my first week. But I’ll decide for sure when the time comes.